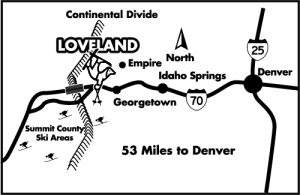 Check out one of Loveland's on-mountain cabins! Need to take a break, warm up or find that perfect place to have a picnic? All of Loveland’s on-mountain cabins are equipped with propane BBQ’s. What’s the catch? Nothing, these cabins are free to use. Loveland’s on-mountain cabins are just another reason why skiers and snowboarders love Loveland. Make sure you stop by and check one out on your next visit to Loveland. Dating back to the late 50’s and renovated in 2013, the Rock House cabin is located at the top of Chet’s Dream. Rock House is a favorite among local Loveland skiers & snowboarders. Enjoy the amazing views from the deck out front and warm up in front of the fire. Located off Lift 8 on Hook em’ Horns, the Ginny Lee Cabin offers skiers & snowboarders a place to hang out on the far north side of the mountain. Newly built in 2014 and named after Virginia Upham, Ginny Lee is quickly becoming one of the favorite cabins on the mountain. Be sure to check out the new Tommyknocker’s Ginny Lee IPA brewed only for Loveland Ski Area. Located at the top of the Ptarmigan Lift, Ptarmigan Roost offers some of the best views of Loveland Ski Area. Built in 1964 and recenley renovated in 2013, Ptarmigan Roost now offers Food & Beverage service and restrooms for our skiers & snowboarders. Located between Lift 6 and Ptarmigan Lift, E-Tow Cabin is the oldest cabin at Loveland Ski Area dating back to the 1940’s. Originally the site of E Tow lift, E Tow cabin now serves as a warming hut for our skiers & snowboarders. Built in and recently renovated in 2012, E Tow Cabin is the perfect place for a picnic or BBQ. Have a company outing, family reunion or just a bunch of friends that want to get together on the mountain? E-Tow Cabin is the perfect place for your next outing. Reserve the E-Tow Cabin and you and your group will have exclusive access to the cabin for the day. Cook lunch on the propane grill, warm up next to the wood burning stove and enjoy the view from the deck with friends and family. Advance reservations are required. No taxi rides up or down for guests or supplies. All guests must ride lift up with skis or snowboard. Not for overnight use. Rental for groups of 10 or more. Call (303) 571-5580 X159 to make a reservation. Online reservations are not available.